If your refrigerator ice maker is leaking water, the first step is to locate the source. This is a guide about refrigerator's ice maker leaking water. I can see water from the fill line going into the ice maker. The water just pours into the icemaker and then instantly into the freeezer to the floor. What causes this? Are you sure it is your icemaker? We had a problem with ice forming on the bottom of our freezer and finally figured out it was too much stuff in our freezer compartment. When we cleaned out most of the frozen goods it has not leaked again. Just a thought! It sounds like the fill valve is no longer functioning. They are easy to replace though. Find the part number for your refrigerator and order one. To replace, unplug the unit and turn off the water supply. Take the rear cover off of the refrigerator and locate the valve(See where the water supply line enters). Disconnect the water lines and the electrical harness. Remove the screw which holds the fill valve and discard. Install new valve and reconnect the wire harness and waterlines. Test the new valve and you should be in business. It appears the water inlet is putting to much water into the ice tray of my ice maker and I am getting large chucks of ice. The auger is also freezing up as it appears water is dripping into the tray and the auger is completely coated in ice at the back where the turning arm is located. Some of the ice cubes are staying in the tray rather trhan dumping into the bin. When valve opens to refill tray some of the water spills over into the icebin and freezes into a mass around the auger. The auger is freezing up as it appears water is dripping into the tray and the auger is completely coated in ice at the back where the turning arm is located. I have a Samsung French door refrigerator with a bottom freezer. My ice maker is leaking water and it is coming through the dispenser. My kitchen got flooded. What can cause the ice maker to leak that kind of water? My refrigerator has a bottom freezer with an ice maker. This is the second time we have had water in the bottom of the freezer. The first time water ran all over the floor. The repair man put in a new timer and the repair was $300. It has happened again. We shut off the ice maker. Would it be cheaper to replace the ice maker or have another part to fix. I don't dare to go away and have the house flooded. When did you do the original $300 repair? Call them back and complain that they did not fix the problem. If it was recent you may be under warranty. I agree with OliveOyl. To take it one step further have the person who did the warranty work return and this time completely remove the ice maker and disconnect it so you no longer have it leaking on your kitchen floor. Make your own ice cubes by using the ice cube trays. I have a Frigidaire SXS refrigerator (FGH2655PF5A) that leaks water from behind the ice maker, which then runs down the back of the freezer compartment and eventually freezes near the freezer fan and obstructs the fan. I have had the ice maker serviced twice and replaced once, but still no fix. It is now out of warranty and Frigidaire is no help. Any ideas on how to determine where the water is coming from and how to correct the problem would be appreciated. When was the last service call? Often the service calls are guaranteed even if the wararenty on the item is expired.n Our microwave wararenty expired in December. But that October the service tech worked on it and his work was guaranteed for 9 months. He came back 3 times before he got it right. It doesn't matter that it is out of warranty. It wasn't fixed properly the first time. I would pursue this and go all the way up to the head of the company. most ice makers have a rubber washer. on the back try taking it out and changing that washer? I have a 13 year old GE top freezer over fridge. I have water coming out of the top hinge holes which is on the side of the ice maker and the ice maker is no longer filling and I can't figure out how to get in there to see what is happening. I a have a Frigidaire refrigerator. When I push the ice dispenser, water comes out of the water dispenser instead and there is a leak below. Nothing happens when I push the water dispenser. Why? The ice maker in my side-by-side does make ice. The problem is I am getting water in my bin, it is then freezing in my bin making a clump and then it won't dispense the ice. I have ice in the bottom of refrigerator. We've replaced the water valve in the back of the refrigerator; so what now? is it coming from the valve or I wonder if the water hose has a split in it somewhere? My side by side Frigidaire refrigerator is 12 years old and has recently started to leak water. When the water dispenser is used for a couple of minutes, water starts to leak and drip from the ice maker into the ice tray/freezer. The ice maker makes ice as normal and only leaks when the water dispenser is used. I tried replacing the ice maker, but that didn't fix the issue. Any other suggestions? Does this sound like a water inlet valve issue or not really since the ice cubes are normal size, are made at a normal rate, etc., and the issue only occurs in relation to extended use of the water dispenser? I would like to understand all of the things it could be in order to determine if it's worth exploring/troubleshooting further or better to just replace the entire fridge at this time, given it's getting up there in age. I'm hesitant to replace the water valve unless the consensus is that it will resolve the issue. Reason being is the tube connections on the latest valve model are different than those of the original, and so tube modifications would be required. Disclaimers: I plan on moving within the next 3-4 years. I'm not super handy, but can follow directions well. (I had no problem removing, sourcing the part, replacing the ice maker.) I have no experience working with water lines or the innards of appliances. I do have experience with computer/technology repairs. When it calls for ice in the ice maker, water comes out of the plastic tube into the drain pan and eventually overflows. It is a Whirlpool mod#ET1MTKXKQ03. The drain hose is at the rear bottom of the fridge. A very easy online search for the "Whirlpool" site will take you to the manufacturer's "contact us" website. You can ask questions via email or call directly. The answering rep may be able to clarify your problem and suggest fridge repair services in your area. Ice maker leaking from module in front of ice cube maker. Have placed a cup in ice collector and now collecting 1 cup every 2 days. Our ice maker was overfilling the tray and creating a mess in the freezer on our side by side GE. Since we rarely use ice I just unplugged the ice maker unit and removed it from our freezer. I left the water line open because we do use the filtered cold water to drink. My question is, is this OK? My concern is will the water tube in freezer ever "turn on" since the unit is now removed. The water is still fully connected because I couldn't see a way to only shut-off the ice maker water supply without losing the cold filtered water supply. Anyone ever do this? Any problems removing the ice maker, but leaving the water supply connected? Thank you. Plumber husband just said once the ice maker is unhooked it's not sending a signal to dispenser valve, therefore no water! Hope that helps! I have a leaky side by side with water/ice dispenser, but no supply line is hooked up to the unit. I have a frozen lake in the bottom of the freezer, how do I fix this? I took everything out of the fridge/freezer for two days to let it thaw. About 2 weeks later I am leaking again. Please help! I had the same issue your freezer's defrost system has a blocked drain hose under the freezer or the freezer drain (inside bottom) is blocked by ice or some other item. I had to remove the back wall of the freezer to fully defrost the freezer and check for blockage (it was ice for me). It's easy to remove the back wall of the freezer or you can call a service person for approx $150. Its not the ice maker - in the floor of the freezer is a small drain that lets the water drain out after it goes through defrost - it sounds like it is plugged up and not draining. Clean out the ice and look and see if you can see the drain - if you can- take some weed eater string and run it through that should clean out the drain. No more frozen lakes. When my ice maker fills the water dispenser is also triggered for a few seconds. I have replaced the filter and solenoid valve. We have a GE side by side with ice/water dispenser. The ice started getting stuck and not coming out. I discovered there was a large frozen piece of ice inside the door where the ice comes out. I removed this chunk. It's forming again and there is a tiny trickle of water behind the ice dispenser lever on the outside of the door in the ice/water dispenser box. We can not find where it is coming from. Any ideas for simple fix? I have a Kenmore refrigerator. While using the water dispenser, water also pours into ice maker. I have had to replace the circuit board as a result of the water pouring through the front of the fridge. I have put a new filter in and changed the solenoid assembly. We recently remodeled our kitchen and are waiting on a few things to arrive. We moved our refridgerator to a new location but the water lines are not hooked up on the ice maker. I have noticed water leaking on the side where the ice maker is on several occasions. Any advice on how to fix this? I think once we have the water lines hooked back up we should be okay, but for now I would like to solve this issue. Thanks. I recently had my floors removed for a toilet leak. When they removed the flooring under the LG freezer/fridg started to leak on the right side where the ice maker is. It didn't leak all the time but ice started building up under the freezer drawer...it never had any issues before it was moved. Could this have been caused when they moved my Refridgerator? What can be the solution? My refrigerator continues to drip water from the dispenser even though the water has been disconnected for some time. Did you ever resolve your problem? I'm having the same issue. Ordered a new water inlet assembly but hasnt come yet. I shut the water supply off but water dispenser still leaks even though no water comes out. If I push the dispenser lever for a glass of water. Unless it's dripping from water still left in the line. We have a Frigidaire refrigerator, a simple 2 door top and bottom. The ice maker works, it cycles, but the water leaks out of the bottom front. Is this an easy fix? After the ice dumps into the ice bin, about a quarter to half a cup of water runs into the ice bin. The ice maker is on a Kenmore refrigerator model 106.9557681. 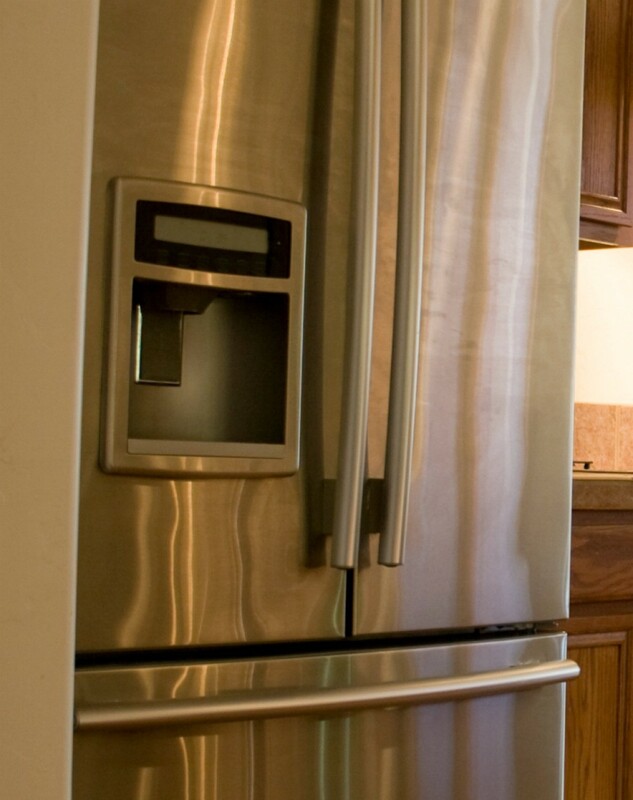 Start simple, make sure your refrigerator is level; especially side to side. Next, if the previous yielded no joy, try adjusting the ice cube size, often a lever, located in plain sight adjacent to the plastic cover on the ice-maker module itself. Otherwise, look under the plastic cover (it often just snaps off with moderate finger pressure), adjust the size setting screw as has been earlier recommended. Next, in logical progression, try replacing the water valve, usually located on the bottom rear of the 'frige. The incoming water line will attach to this valve. You'll need to locate the ID plate/decal for the model & probably the serial numbers of your machine (the location will be offered by most online parts purveyors). Shop, you'll find a disparity in prices; don't overlook local sources, they'll often price match to get the sale, plus you'll often save the shipping. I think you'll find that the timer function is handled within the ice-maker module itself, although there are a few exceptions. You may be pleasanly surprised by the economy of replacing the ice-maker module in its entirety; it's usually simply done too. Can you see the usual pair of fasteners below the unit? There will be a wiring harness to disconnect as well, generally hidden between the ice-maker module & the rear wall of the freezing compartment. You had best unplug the 'frige before performing the disconnect; 110 volts in combination with water IS hazardous to your breathing permit! I have only replaced ONE complete ice-maker module which I have owned personally, & that was caused by the abyssmally hard water found in the area. Water drips into icemaker bucket after ice is deposited, any help? I have a GE side by side refrigerator with an ice maker. It has worked fine since I got it, however now it seems like something is clogged. I keep getting water on the floor and it seems to be coming from the back. I did clean the hole on the bottom of the freezer with baking soda and hot water like the book suggested, but it didn't do anything. Now, I turn on the water for a bit until it makes ice then shut the water off. As a result I can't use the water dispenser. Any ideas? Thanks. There is a drain hole in bottom side of freezer that is probably stopped up. Pour warm water mixed with baking soda in hole until it flushes clean. The water goes to your evaporater pan under the fridge. My ice maker drips water. Then it leaves a big clump of ice in the ice container. The clump of ice in the ice holder doesn't let the metal part rotate to push the ice out. What do I need to do? We have a Kenmore side by side. At times the icemaker will not eject the cubes and when the water comes back on to refill it runs into the collector box. When this happens the whole thing freezes into one huge chunk. We then have to remove the ice maker box and chip out all of the ice. This does not happen every time so we try to keep an eye on it and keep it turned off when we have enough ice.